1. Fontina pepperoni pizza for Eddie on Sunday, and I was extremely depressed that this one photographed so much better than mine. 2. Guys! This pastel rainbow cake? It’s straight out of my dreams. 3. Inquiring (and boring) minds want to know: do you do your laundry all in one day, or do you do a little bit everyday? 4. Having a strong overnight oat obsession this week, where I just mix equal amounts oats with almond milk and let it sit overnight… then trash the top up like it’s nobody’s business. Except now it’s yours! 5. I’m sure it’s my 80s-90s heart talking, but I love the off-the-shoulder trend so, so much. Or, let’s just call it the Kelly Kapowski salute. 6. THE WALKING DEAD!! I was pretty much sick to my stomach watching the entire episode. I was claustrophobic! I wasn’t as devastated by the ending as everyone else was, because I can’t take losing someone I like. Billions: I can’t get over the chemistry between Wendy and Bobby, they work so well together as actors. Also, I was dying for some insight into how they knew each other, and I think we got that? The scene on GIRLS with Hannah watching out the window was perfection, even if I absolutely cannot stand the character. And, how stunning does Jessa look this season? And finally, am I the only one who weirdly wants Meredith and Alex together on Grey’s? Are they going there? 7. Also, shocker, I’m definitely loving the West Wing podcast and therefore, (super) slowly rewatching the series. 8. As a major magazine junkie, tell me: which one is your fave? 9. Challenge yourself to always be a rookie at something – do you do this? Can you do this? I want to make it a life long goal. 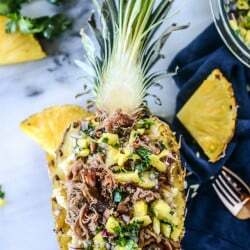 Slow Cooker Jerk Pork in Pineapple Rice Bowls. Ok, I think Grey’s is going there too!!! Especially when they were both sitting by the fire…maybe foreshadowing something? I don’t know, I still think it would be totally weird but it would also make SO MUCH SENSE! I’m glad you said this because I have been thinking this. I would feel really bad for Jo, but it doesn’t seem like Alex cares about her that much anymore? Something needs to happen with Alex and Jo – either be together or end it. 90’s kid here! Zach Morris phone, what? Laundry – All in one day! Though, I consider myself lucky. My husband and I do our laundry separately. I like mine done a certain way, with my natural detergent, certain clothes in the dryer, certain clothes hanging. He likes his done a different way – wrong, ha! I do the towels and sheets b/c I want my detergent used – then he helps fold and put the beds back together. I do have to confess – we don’t have kids. I feel our set up would not be the same if we did. I LOVE LOVE LOVE the single shoulder trend!! I’ll be holding my breath until October when the Walking Dead returns! Hands down, Food and Wine is my favorite magazine. Recipes, photos, inspiration– all on point. Plus wine. I am the worst with the laundry! I always have a load in the dryer to fold. It never fails that I find it in there when I need to transfer laundry from the washing machine lol. I am so bad…Favorite magazine is still In Style – has been for years! Billions was crazy this time with Wendy and Axe! And whoa re: Chuck!!!!!!!!!!!! I usually just wash all of my laundry in one go. However, it doesn’t always get folded and put away all at once… I wish I had a laundry fairy. Wouldn’t that be grand? I’m certain this will change when we start adding children to the mix. Laundry every day. I have two little boys who both generate at least a load of laundry each 2x/week (seriously, can’t they keep their shirts clean for more than a few hours?) and am the type of person who washes towels and sheets bi-weekly so there is always laundry to be done. There is no way I would stay on top of it if I didn’t do a load every day. I had no idea Alex & Meredith were heading that way, but I haven’t watched since waaaay back when they killed off George. It’s weird to hear what’s happening now. Have you seen The Catch yet? I am LOV-ING the off the shoulder look and need to stock my closet. I also have developed a recent obsession with wanting Birkenstocks… apparently being a child of the 90s the recurrence of these fashion trends are meshing with my soul. We are doing a sermon series at church based off of 90s TV shows and I dressed up on Sunday and people kept saying “Oh my gosh. You look like Kelly on Saved by the Bell.” I took that was a sincere compliment and wondered if I should just “update” my closet to all of the 90s trends (minus the chokers and clunky shoes). As for laundry, I usually do it over the course of the weekend so the whole week we’ve got clean clothes/towels. what?? i can’t imagine alex and mer together. it also seems like all relationships are doomed in grey’s, so i would hate for them to end if they every got together. and if they were together, mer wouldn’t really have a person anymore. Monday is laundry day. All laundry must be done on Monday. Where is your Sephora sale shopping list?!? Can’t wait to compare notes! Laundry done bit by bit every day. Except for the fact that I feel like I have so much more clothes than my husband, so he ends up running out of clothes quicker. Hence, I get my laundry done like every 5 days and his is done on a daily basis haha. Fave magazines: Fine Cooking & Cooking Light. LOVE that article about being a “rookie.” Sometimes I struggle with not being able to do certain things well, then I realize – that’s the whole point in life!!! Also, my husband is obsessed with the Walking Dead. I will not watch it with him because I’m a bad wife who does not reciprocate on TV show watching. But, he told me about the little girl, Judith, and I can’t stop thinking about her and if she’s OK or not. I don’t even watch the show. This is what moms do, I guess lol. Yes, Yes, Yes to Meredith and Alex. I’ve seriously been thinking the same thing all season!! I feel you on The Walking Dead, I was holding my breath the entire episode because I knew what was coming, or so I thought. I’m not looking forward to someone dying but I had mentally prepared myself for it! Now I have to wait until next season and be stressed out all over again. AGH! Oh and I love magazines. Hands down, Bon Appetit mag. 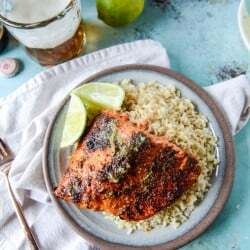 Its the only food magazine that I feel is a fun read, AND has recipes that almost always taste awesome and are worth the effort (I used to get Saveur and Cooking Light and can’t say the same about those). If you have a Carnegie library card, you can send all of their magazines to the Nook app. Granted, I prefer paper magazines over the e-versions, but since these are free it is worth the sacrifice. They have a huge selection. I think both pizzas look delicious and wish someone (other than me) would make them for me. I try to do laundry throughout the week but more often than not it ends up being several loads in a day. Also, if I do my laundry one load at a time, that one load doesn’t leave the dryer until its forced out by another load (which can be several days). And since my dryer = my iron, those clothes get dried a lot. I save all of my laundry up for one big day then just let it run! I used to have a laundry day, but since the second child (and cloth diapers), I have to do laundry every day, or else it gets crazy! Also, you read my mind on the off-the-shoulder trend. Kelly Kapowski was my fashion emblem. I have 3 boys so I do all the laundry all the time. Constantly. Laundry for days. I’ve given up; laundry, you win. I’ll move out. You can have my house. As far as Greys, I read an interview w Ellen Pompeo a few years ago when they did that bizarro episode where she and Alex were engaged and she said it was so weird BC he’s basically like her brother, in real life and as characters, so I really don’t think they’ll go there. Whatever. I tell myself I don’t care BC I’m giving them the silent treatment after they killed off Derek but obviously I’m just kidding myself. ?? I love that you and Eddie each had your OWN pizzas on Sunday. The Walking Dead… I had anxiety the entire episode and the last few moments turned my stomach. Preparing myself mentally for whats to come in October. My laundry starts Friday night, I try to do at least one load. Then Saturday (during the day) put another two and then (hopefully) put the last one in on Sunday afternoon/night. This does changes in terms on how many loads are put in along the weekend ( if going out Saturday then I try to do as many as possible Friday night) and usually the load is taken out of the dryer as soon as the following load gets out of the washer. Not everything gets folded right away and at desperate times clothes have been taken out of the dryer and placed in a clean pillow case and taken from there for use. Both pizzas look amazing, I had a major pizza flop tonight. The middle didn’t cook through :( and I blame it on the dough, it kind of bubble up. Made your easy dijon honey skillet chicken last night and it was delicious and had leftovers. YES- Meredith and Alex need to be together. Remember the If/Then episode where they ended up together? That needs to happen! I’m also tired of Avery being a jerk. I’m convinced he has a brain tumor and that’s why he’s being awful. Totally do a little laundry every day. I can’t imagine saving it all up for one day. Like where even put it all when its dirty?! Also? The level of discomfort during the first scene of Girls with Hannah was just too much! My fave magazine right now is Lucky Peach (they have a great Facebook feed right now, too). You should def. check it out if you haven’t already. I’ve lucked out with laundry- 95% of my wardrobe is black, so I just do a load when I have enough clothes to fit in it, or if I run out of underwear, whichever comes first. Sunday is cleaning day, so I wash my towels/sheets and do a little cleaning while they’re doing their thing in the washer. When they’re done, I’m usually done with whatever I had to clean. I have a bunch of 90s babydoll dresses that I wear when I’m trying to ignore how old I’m getting. Still love them with tights and Doc Martens. I wait until I am practically out of clothes and do all the laundry all in one day. I think your pizza looks better!!!!!!!!!! And sometimes I do my wash all in one day, sometimes I do a load a night, depends on how much I have to do and what kind of mood I’m in during the week after work! Sooooo hooked on Billions! Sad note: next week is the season finale. All I want yo know is when is it coming back??? Also, I had never watched West Wing until a number of years ago when I was in bed with a badly sprained ankle (“stay off your feet for a week”) and West Wing was on for 24 hours straight. I became obsessed. Great show with brilliant acting. Why are all the best shows gone? Walking Dead, I wasn’t mad about it either. I was pretty much curled up in the fetal position the entire time. I was a little relieved that they didn’t show who died. Grey’s…I am picking up that vibe. It wouldn’t be the weirdest thing that they have done on that show. I try to do a load of laundry (including folding & putting away) each day but, that doesn’t always happen, so the catch up day is Sunday. Magazines are my love language. Real Simple, InStyle, Garden & Gun, Fast Company, Entertainment Weekly, Glamour, and Southern Living. And I second The Catch on ABC. This week is the 3rd ep and I LOVE IT. With a husband and 2 boys I NEED to do laundry everyday but just can’t bring myself to. So there’s always a pile in the basement needing to be washing and a clean pile in their rooms. My husband and I have “folding parties” for Friday Date Night where we watch a show and have a cocktail while we fold. Simmer down with the excitement, I know! I’m sorry- Meredith and Alex WHAT??? I stopped watching Grey’s years ago (I just couldn’t take it any more. So much drama! So many bad decisions! I’m a social worker, I don’t need that on my downtime!) but I recently started re watching the first few seasons (that I haven’t looked at since college) and so I weirdly kind of…like it that that might be where they’re going. I mean, Alex has to be the last man standing at this point, right? No one else is left from the beginning! I keep getting that vibe from Alex and Mer as well! And I had a feeling they were going to go that route when they started mucking up Alex and Jo’s relationship. At this point it’s hard to tell if they are even together or just living together? I also thought she may get with the new doctor that Owen hates so much (too lazy to look up his name). Or maybe him and April? I mean, they can’t bring on a hot new doc just to mess with Owen, right? He has to be there for a lady doctor to get with. I started watching Billions because you liked it and we have the same taste in TV. I love it! It’s funny because my husband works in the AG office here in NYC as an attorney and he hates the show! He says there is not nearly that much drama going on, which I mean hello it’s HBO of course there is not! I do our laundry all in one day because we don’t have a washer/dryer in our apartment. It’s kinda nice actually cause I can do three or four loads at once and be done in two hours. Nice list of articles again. I have been a regular reader of your “Tuesday Things”. The rainbow pastel cake looks sooooo deliciously yummy. The piped stars on the top is so vibrant with beautiful colors. And yes, you are not alone in wishing that Grey and Alex to unite. There are lot more people wishing the same including me. Dude – loving the West Wing podcast! I’ve been re-watching each episode before listening to the podcast and it makes me so happy. I love that it’s Josh Malina too! I do a load of laundry every single day. I would drown in it otherwise. Some days I do two loads. I know it is such a waste of water and electricity but kids are messy. Pre-kids I did 2 loads a week, all at once. Magazine junkie over here, but my faves are Bon Apetit, Sunset, and Lucky Peach…throw in a Mental Floss every now and then for some fun knowledge. I wish I were better at doing laundry as it piles up but I usually just have to cram it all into one laundry day and by the end I’m SO over it. Sometimes smelly, sweaty workout clothes get done daily out of necessity lol. I always do all my laundry on Sunday…wash, dry fold, put away! Totally want Alex and Meredith to be a couple!